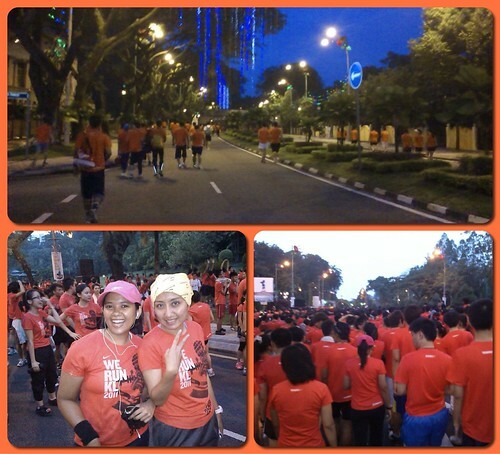 It was almost 7am when we reached the starting line at Padang Merbok from Masjid Jamek LRT station. Because it happened during the Standard Chartered KL Marathon in June, I joked that by the time we get there, the race would’ve started and we wouldn’t have time to properly stretch and warm up. I know I’d be right so I made sure to loosen up a bit at home. Brisk walking to the venue also helps to raise the heart rate. As I weaved my way through 8,500 participants to find my spot, (some were sweating buckets already and the run hasn’t even been flagged off!) I meet up with a fellow runner, Farisha, and together had time to bare toothy smiles for one last shot before we submitted ourselves to the open roads. The grins quickly faded when we were faced with the back of someone’s head, sporting the most depressing looking mullet. Oh God, can we run already? The run stretched 10km along various landmarks in KL including Parlimen, KL Sentral station, Muzium Negara, Masjid Negara, KTM Railway Station, Bank Negara, Tugu Negara, and back to Padang Merbok. The route started out the same as Standard Chartered KL Marathon but 3km in, instead of veering right into Little India we turned left to pass KL Sentral and beyond. There were Indian, Chinese and Malay drummers on the sidewalks on parts of the route, beating rhythmically on their respective drums. The beats served as a type of booster and motivation to the runners I suppose, and to some extent it worked. I thought it was beautiful. Metronomes for quarter marathoners! In this race, I was blessed with relatively mild KL weather and an even better-behaving right knee whose muscle and vein kinks I managed to iron out with persistence and practice runs. I was determined not to repeat my rather miserable time at Adidas King of the Road in October. However a minor Achilles’ heel was to make an appearance following the first water station stop at km 3. Yes, I had to pee! Peeing is not really a problem at these things really since porta-johns are plentifully supplied. The catch is, other people have to pee too, so there were centipede-like lines at each one. After gulping down my first cup of water, I tried to wait to use the loo but after about a minute I grew impatient and anxious because I knew I was eating into my finishing time. Then I remembered Mims mentioning in her recent Penang half marathon race recap that sometimes you need not heed the call of the bladder because the feeling will dissipate. Also, there are usually more isolated toilets further up ahead. I tried to inject some logic into my decision to not use the toilet yet by telling myself that I could lose water through sweating than through peeing. So I grit my teeth and pressed on. What do you know, I managed to hold off the pee till about 8km, after I found some porta-johns that were empty. There were no lines for a reason of course, the johns were absolutely filled to the brim! I had no choice but to brave the stinky water element, with eyes and nose closed, praying the bowl could take a few more ounces of waste. Another observation I made in these running events: if you’re gonna stop for water, then don’t bother going to the first table you see as it will be overly crowded and the poor volunteers won’t be able to refill the cups fast enough. Instead, head down further to the next few tables, there will be far less people and more water cups than you know what to do with. I’m not a blazing fast runner, but where possible I aim to maintain consistency at the fitness level that I am at. I kept checking my Garmin watch to make sure I was keeping at an acceptable pace and heart rate. Whenever my heart rate went up to as high as 98% of my maximum heart rate, I slowed down slightly and did not try to be all heroine by over exerting. Yes, I’d like to finish but not in an ambulance, thank you. The last 1-2km of any 10km runs are always a bit of a stinker for me. By that time I know I’m almost at the end so the body tends to relax involuntarily, especially when the eyes see the last mile markers. The elevations of the road were not helping ease my movement, so really it was all mind over matter from here onwards. As I edged into the last km, panting and perspiring like water works gone wild, I passed a female runner who was nonchalantly strolling along, yakking audibly on her handphone. She was already make post-run breakfast plans with her friends and the race hasn’t even ended for her! 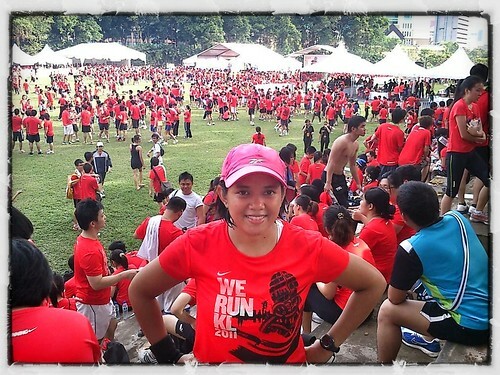 Typical Malaysian I thought, always ‘makan’ on the mind, even while running. I picked up the pace and left her in a dust trail, or so I liked to imagine, hehe! The last kilometre was marked every 200m with a sign board which drove me bonkers and added more stress for me to finish strong. As I reached the finishing line I see swift-finisher Farisha done and all prepped up with her Blackberry, ready to snap a photo of me. I mustered a smile and stretched my arms outward as I sprinted to the end. I finished in 1 hour 24 mins! As I made my way to the athletes care area, my heart rate steadily and slowly declined to resting heart rate, and I was craving for hydration. 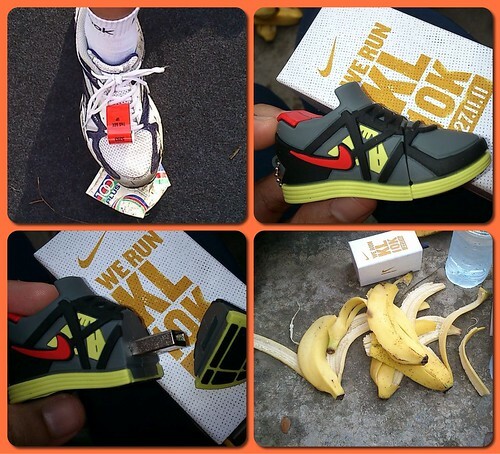 Fellow runners were lined up before the tents to get water bottles, bananas and a special souvenir. Instead of finishers medals like in most races, we were presented with a small box that slid out to reveal… a plastic replica of a Nike sneaker. “It’s a thumbdrive!” exclaimed the event volunteer excitedly. 1 Gigabyte-worth, to be precise. I got to admit the idea was novel and cute. I met up with Farisha after the run along with a few of her friends, including a guy who scarfed down 5 bananas because he was so hungry. I even gave him my giant one because I was not in the mood to chew and had wanted to see how many bananas a guy can actually eat before throwing up. I never knew because we ran out of the fruit. “Hey, they’ve got ice cream and pizza booths! Let’s go get some!” said one girl. Good grief, is this a running event or a carnival, how can anyone stomach junk food after a 10k? That can’t be good for you. After milling around the Nike merchandise area and watching Joe Flizzow perform for a few minutes on stage, we decided to head down to Jalan Tunku Abdul Rahman for iced Milo and roti canai. Yes, wholesome if not nutritious Malaysian fare. Overall, the Nike event was well run with plenty of water for runners, the route was scenic and distance was good, and most importantly the weather was conducive. 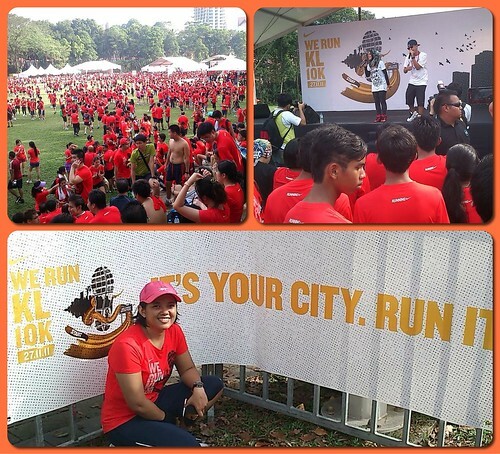 Plus Nike had that crazy orange t-shirt color thing going on so we looked like a trail of fire blazing through KL! I did have one thing to gripe about: slower runners or people who have tire and resorted to walking should keep to their left lane and not hog the right one. I wish they’d be more considerate to those wanting to go a bit faster. I experienced a few near-misses thanks to these people. It’s supposed to be a running feat, not an obstacle course. This was my 5th running event of the year and I hope to continue running these things for as long as I can take it. Fay, you look great in sport suit. The route is similar with my KL Boot Camp training, only mine was shorter. I miss KL so much. Hope to see you again there. Hey Stania, great to hear from you. Wow, I did not realize you actually entered the Boot Camp in KL! That’s phat. How did that go? Thanks for your compliment. 😉 I was always sporty so the attire always suited me. I try everything in KL: Fitness First membership, swimming, Boot camp, diet (only eat salad for lunch and fruits for dinner). None of them worked. I finally managed to reduced 4 kilos weight thru fasting during Ramadhan. Now a bit reduced by being PNS, as I don’t have money to buy greasy delicious food….